Ok, you are hooked up with your float tube and all the accessories you need for a day on the water. Now, let’s consider some float tube fishing tips that will come in very handy in landing fish, retrieving snagged lures and more. The number one component to a successful day of float tube fish catching is always remaining aware that you are relying on an inflatable object to stay afloat with sharp hooks aboard. These tips will keep you afloat and make landing fish less challenging! Yes… there is a need to discuss this! Moving around with flippers is awkward enough, let alone with an inflatable boat and a fishing rod. Here’s how to do it as gracefully as possible. 1. First off is your shoes. Tuck them in a pocket on your float tube, that way you can get out at any point on the shoreline and walk if you need to. 2. Put the belly boat in the water then ease both flippered feet into the leg holes. 3. Holding your rod in one hand, put both hands on top of the tube on each side. 4. Using the tube to help balance yourself, walk into a little deeper water – anything over 20″ or so is good – and then just sit down.Walking with flippers is easier backwards, but if you really need to go forward, be sure to lift your feet up high enough. 5. If you feel yourself slipping or off-balance, then immediately SIT DOWN. By the way, be VERY careful when you get in, especially when getting in from a spot where other people normally shore fish. When those shore fishermen get snagged, they generally just break off and re-rig, so there may be hooks, small lures, and fishing line that you can get tangled in, not to mention poking a hole in your boat in the first five minutes. That’s another kind of unseen bonus of belly boating. You’ll find lures and be able to retrieve them from virtually anywhere. I’ve already collected about $30 in broken off lures. It’s almost like they grow on trees! HA! Fish control is of the utmost importance. When you first hook a fish, your legs are down in the water, giving you stability. Two things will happen – either you’ll have to go to the fish, or the fish will come to you. If you’ve got to go to the fish, move quickly and keep tension on your line. Don’t just pull yourself over with your rod or the chance for a break-off increases. Remember, with your flippers there is literally no place that you can’t go. On the other hand, if the fish comes toward you, you’ve got to be ready and alert. When the fish is 15-20 feet away, tuck your legs up tight beneath you and point your flippers behind you. You will be in a position like when you are kneeling on the floor. You’ll find that most fish will be eager to dive right underneath you, and you don’t want to get your lure and a 9-pound bass (or any size bass) stuck to your flipper. Fish do that a lot, so be expecting it. When you’ve got the fish ready to land, don’t be shy. 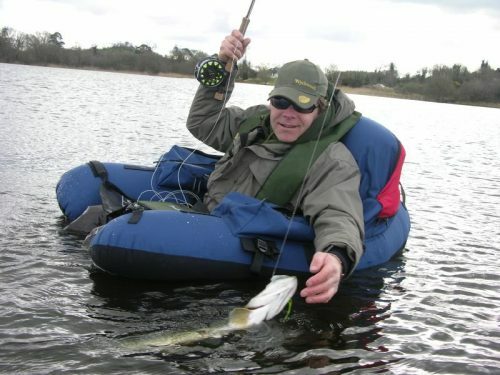 Whether you are lipping a bass or carefully gill-landing a big pike, do it and do it quickly. Even a solid head shake at the side of the boat with a sharp-hooked lure could put an early end to your day.Put your hands OUTSIDE the boat to grab the fish, don’t swing the fish at your face. If you get a snag, try to go to the lure. Don’t start by yanking and pulling. If the lure does come loose and flying towards you, you could be faced with rushing to the shore for repair of your boat, or God forbid, repair of yourself. Remember, you are at eye level with your lures in a float tube! Above all, let’s be safe. A snagged lure can quickly end your day – ask my Devil’s Horse top water lure… it put a hole in my boat during one of my early trips. The same hold true when you set the hook. Sweeping to the side is highly recommended over setting straight up and back toward you. same reason – if the “fish” ends up being a tricky clump of weeds, you don’t want a lure whizzing at your face or boat. Handling lures from your float tube takes a little more consciousness than shore or boat fishing, obviously. You’ll want to be sure that you keep things in order. Put away loose lures immediately, or you may find them snagged on your arm or boat…or you may never see them again. Make sure there’s a place for everything and everything is in its place before you cast. Make it a habit to wear a life vest when you’re belly boating. There are some very comfortable, low profile ones out there. Plus you’ll like the extra storage in the pockets. Most importantly – The life you save could be yours. Expect the Unexpected. Remember, as you move along, stick your flipper down every now and then and feel for the bottom. You may just happen across a shallow point or hump full of fish. (Yes, you can get that close to the fish. Most fish I accidentally spook are three feet or less away. You may even attract a small school of fish. Float Tube vs. Small Boat? The challenges of boating in the wind can be negated with a float tube. Since your legs are in the water, you’ll come to a point where you automatically adjust for the wind conditions without thinking about it. I also have a small bass hunter boat and the wind blows it around quite a bit. With a belly boat you are in complete control at all times. As you can see, belly boats can be used virtually everywhere with an absolute minimum of hassle. You can put together a really nice belly boat outfit for about $400, and that includes the boat, waders, flippers, and tackle. They’re easy to pack, easy to carry, easy to maneuver and fish from, and they open up total access to the structure and shoreline of the lake or river. Over the years, I’ve caught lots of fish from a belly boat. I’ve been eye to eye with a six-pound bass. I know that doesn’t sound really big, but seeing this fish at eye level three feet away and I swear to you – she might as well have been Godzilla!